calendars, but use pencil, just in case. Legends of the Pacific, and Enduro Series Race #1. This promises to be a great kick-off to the Season, so you won't want to miss this one. FRIDAY PRACTICE: Open Testing. All Divisions welcome on April 1st for Friday Night Oval Testing. In an effort to keep costs down for the fans and drivers with the rising costs of operations, it has become necessary to keep the grandstands closed on practice day. 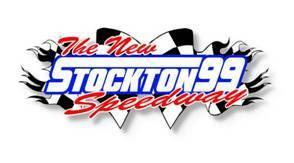 The New Stockton 99 Speedway is located at 4105 N. Wilson Way, ¼-mile west of Highway 99.
or visit their Website at www.stockton99.com. In 2006, word spread fast that Stockton 99 Speedway was in line for the wrecking ball because the land owners decided it was time to raise houses instead of race car drivers. True to rumor, the final night of racing came to pass on September 16, 2006, when racers from far and wide converged on "The Toughest Test In The West" for their final chance to tame the tricky asphalt surface. It turned out to be one of the greatest nights ever at the storied venue, and the saddest. Death came quick. For the next two years, a cloak of silence fell over the Speedway and the only things to hit the Saturday-night surface were the tangles of weeds that rose through the cracks and crevices woven throughout the dilapidated blacktop. Our racing family scattered to the four crooked heavens as we all became orphans and step-children. Apparently the Racing Gods took exception to the situation and decided to intervene. The housing market crashed and the deal fell through. There was finally a visible light at the end of the tunnel; a glimmer of hope. And that hope came in the form of Tony and Carol Noceti. In 2008, the Noceti's fostered a plan to resurrect the "Old Girl" as they entered negotiations with the land owners to lease her for five years. 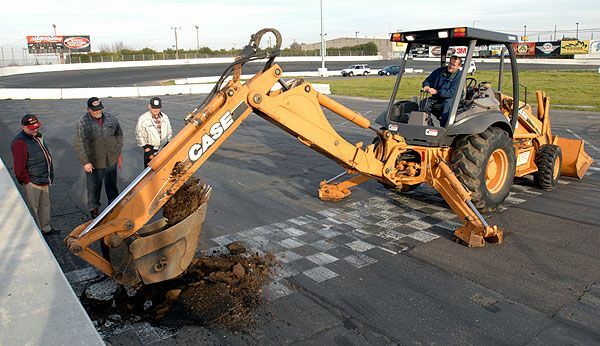 The negotiations were successful and after much preparation and hard work, Stockton 99 Speedway rose through the dust and debris to reopen her gates for the 2009 Season and take back her place alongside some of the greatest short-tracks in the nation. In fact, over the first two Seasons, the Speedway was named Top-Ten of NASCAR Short-Tracks. Also, speaking of breeding great drivers, in 2009, Jacob Gomes won the inaugural National Rookie of the Year honors. Last year, first-year Late Model driver, Chad Holman, brought home the California State Rookie of the Year honors. Over the holidays in December, the Noceti's found themselves back at the negotiation table. This time for a much larger prize: a ten year extension to the current lease, which will see the current property run as a race track until 2021. Stockton 99 Speedway, as she should be, is back to raising race car drivers, for many years to come. With the anxiety of the off-season reaching its pinnacle, and race cars pulled from the moth balls, it's time to rev up your engines because the 2011 Season is upon us. However, before we can get on with business as usual, there is some unfinished business that needs to be taken care of, and that business comes in the form of the Fall Classic. Because Mother Nature's desire is always greater than mere human's, the Classic was reset for Saturday and Sunday, March 19th & 20th, 2011. As we all know, there is no cure for time: she just keeps comin'. And the time has come to take care of the business at hand. We, at Stockton 99 Speedway, hope everyone had a great off-season and we wish everyone the best in the 2011 Season to come. It promises to be an even better year with many improvements and some surprises as well. There is going to be a new Premier Division at the Speedway this year: the Super Stocks. The Western Late Models will still be in action, but on a limited schedule to try to offset tough economic times. They will, however, still be running the Holiday Classic Shows which have become synonymous with the Speedway throughout its history. Also on the agenda, the SRL Spears Southwest Tour Series Late Models will be joining us on two occasions this year. And, if you want to see racers serious about racing, this Series is the best in the west. USAC returns once again along with the NCMA Sprints. Things happen quite quickly in these Open-Wheel Divisions, but the speed is what brings the fans from far and wide to catch a glimpse at the talent behind the wheels of these high-powered rockets. The Legends of the Pacific, one of the finest run Series around, makes several appearances as well as the Enduros and the Stockton regulars. So, you can clearly see, there is something for every kind of racing appetite to devour. Come join us this Season at the Toughest Test in the West and help make it, as the fans always do, the best year ever.